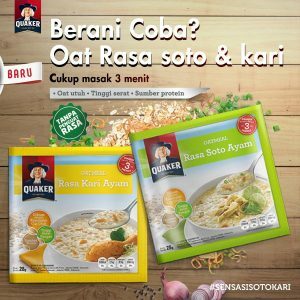 To make oatmeal the breakfast choice for Indonesians, Quaker, the oatmeal brand of PepsiCo, has replicated in Indonesia the flavour localisation strategy that it has been rolled out in Malaysia. 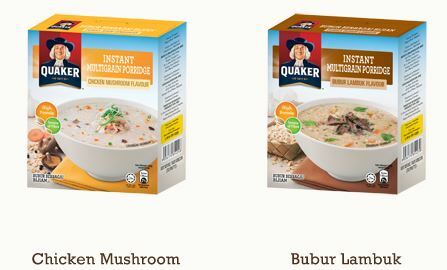 In Malaysia, Quaker Instant Multigrain Porridge comes in two flavours – Bubur Lambuk and Chicken Mushroom. Bubur lambuk, literally known as ‘scattered porridge’, is traditionally consumed by ethnic Malays during the holy month of Ramadan. The porridge is prepared by throwing the ingredients together in one big pot. Muslims will often line up at mosques to take home the dish, which is usually given away for free. The chicken mushrooom flavour is a more Westernised flavour suited for the multi-ethnic racial composition of the Malaysian population. The multigrain porridge is made with oats, wheat and rice. 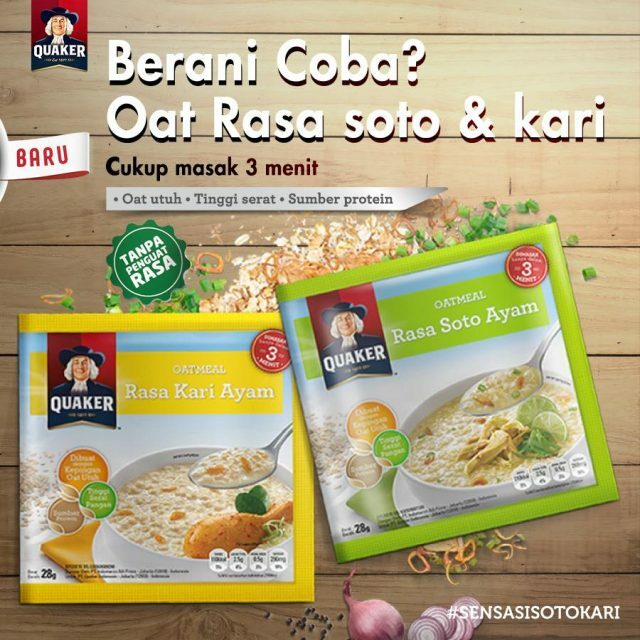 In Indonesia, the new Quaker oatmeal comes with Rasa Kari Ayam (chicken curry flavour) and Rasa Soto Ayam (chicken soto flavour). Unlike the Quaker instant multigrain porridge in Malaysia, the Quaker oatmeal in Indonesia needs to be cooked or microwaved for three minutes. The new Quaker oatmeal serves as a healthier option for breakfast as it is high in fibre and is a good source of protein. Moreover, there is no flavour enhancer. Each pack contains baked shallots and leek to replicate the bubur ayam or chicken porridge popularly consumed by Indonesians in the morning. Quaker does have the recipe for Quaker bubur ayam but it requires a lot of effort to prepare especially when consumers are often rushing to work or to school in the morning. For the Quaker oatmeal, consumers are encouraged to add other fresh ingredients to complete the meal. The new Quaker oatmeal provides a quick and healthier alternative to bubur ayam for morning breakfast. There are consumers who like their oatmeal plain or added with sweeter ingredients like fruit pieces. For those who want a savoury experience, they now have the option of Quaker Oatmeal localised with the soto ayam and kari ayam flavours.